I've made a userscript that allows you to self-destruct comments that you've made. Once installed, next to every comment you write, self destruct will appear next to. Clicking this will prompt you to enter the number of days in which to delete the comment. This will be saved with the ID of the comment and time you want it deleted. A check runs every hour (every o'clock) which checks all comments' desired deletion times and compares it with the current time - if it has passed, it will delete the comment. This is completely client-side - it will only work as long as your computer is on and the browser is open on a page - ie. in normal cases it will work, but if you don't use your browser for a few days, it won't work until you use the browser again. This will only work on devices where you have set it up (obviously) that you use on a day-to-day basis. Please post any bugs/feature requests here. Ok, not a answer but some visuals how to get it going for dummies like me. 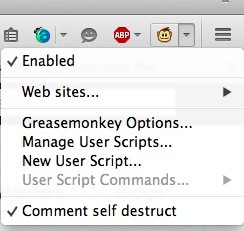 Install Greasemonkey (for Firefox) or Tampermonkey (for Chrome) - I'm using Greasemonkey for this post, but it's the same for Tampermonkey -- you will get a new icon on the top right of your menu bar AFTER restarting Firefox. 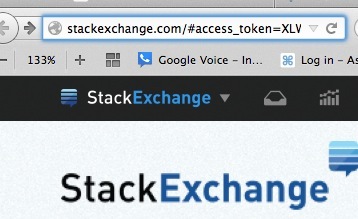 Now at the top left where the web site address bar is GET your token: Copy the alphanumeric stuff in between the first = (from access_token) up to the next "&"(before expires), including any brackets. There you go, you got your Token! 0 days? (I'm not sure what you want the behaviour of 0 days to be). It didn't remove the comment. status-norepro: Make sure you wait until the next o'clock after submitting 0, and make sure your access_token is up-to-date. Hours, rather than days? status-declined: Just express the amount of hours as a decimal of the day (eg. 0.5 days == 12 hours). As a mod (on a smaller Stack) it's sometimes useful to let comments be right now, but you know they should be cleaned up soon. But you also know you're not going to be back here tomorrow, so you have to instead decide between no cleanup or instant cleanup. Being able to schedule others’ comments for mod-deletion using this script would be very useful in these uncommon but not rare cases. Could the self-destruct widget be added to all comments on a site when the script-using account has moderator privileges? Can not make it working on Firefox. However, the stackexchange (my profile) shows the app installed under the "apps tab"
However, there is still no " profile page at the top: click self-destruct access-token". The SENotifier leads to http://hewgill.com/senotifier and it works. The Comment Self destruct leads to: https://stackapps.com/ ?? this might be the problem! After you fixed it for the Firefox it now works and shows up...Great job. Symptom: The self-destruct button doesn't appear. A find-and-replace for .text() == replaced with .text().replace('♦','') == enables the self-destruct button for moderator messages. I think a feature should be added to make comments which have been replied to (@Username) not self-destruct, or at least ask the user if he still wants the comment to self-destruct. Otherwise, people reading the comments on that question/answer wouldn't know what that comment was replying to.